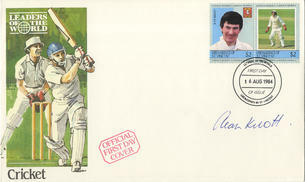 This is a Hand Signed Leaders of the World Commemorative cover postmarked 16 AUG 1984 in Grenadines of St Vincent by the former England Test Cricketer. Alan Philip Eric Knott (born 9 April 1946 in Belvedere, Kent, and educated at Northumberland Heath Secondary Modern School,) is a former Kent County Cricket Club and English cricketer, as a wicket-keeper-batsman. He played for the England Test side between 1967 and 1981, and was a Wisden Cricketer of the Year in 1970. He was particularly known for his habit of conducting limbering-up exercises at any inactive moment during a match. His major strengths as a batsman were the sweep and the cut.